Bear & Co. - Bear & Co.
Shakespeare in the Park: The Tempest toured parks in and around Ottawa July, 2015. Join us for a tempestuous evening in the park this July! Bear & Co. roars back into Ottawa parks this summer in a rough and tumble performance of The Tempest designed for the outdoors. Seasoned Ottawa director Eleanor Crowder wields the elements to transform the park into the mystical island setting for Shakespeare’s final fling. This will be a performance to remember, complete with music direction by Rachel Eugster and a fire dancer! Bring your blanket - and your water gun! Featuring Doreen Taylor-Claxton, Chris McLeod, Hannah Ehman, Isaac Giles, Zoe Georgaras, Alexis Scott and Sarah Waisvisz. All shows begin at 7:00 p.m.
Come to our opening for delicious pizza and paninis from What the truck! If you arrive early (around 6:00) to our opening on July 3rd at Strathcona Park, you will be in for a treat! 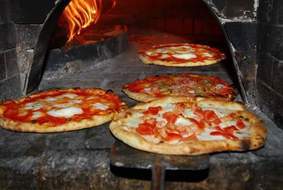 A food truck that serves wood-fired pizza and paninis will be cooking up some delicious food for the early birds. The magical spell of Shakespeare's "The Tempest" is being conjured in parks throughout the Ottawa area this summer. 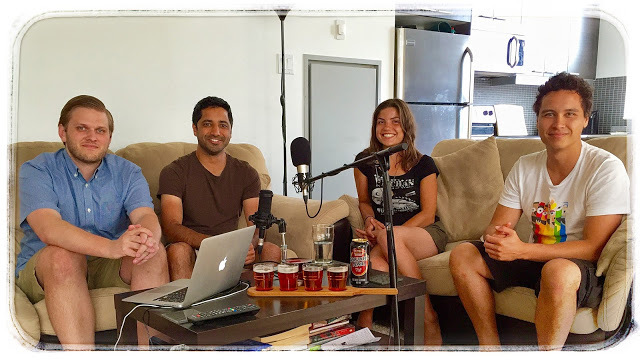 We spoke to fire dancer and actor Zoe Georgaras this week on the show. We learned how she got introduced to fire dancing, how fire safety and good insurance are critical components of her craft, and heard about Zoe's travels across Canada, and her experience performing with the Fire Liberation Front. 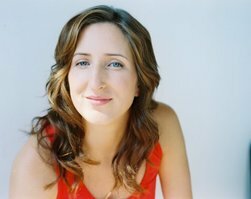 You can see her and another past guest, Alexis Scott, in the Shakespeare in the Park performance of the Tempest all across Ottawa until July 26th with Bear and Company. Like most of Shakespeare’s work, The Tempest follows a few interweaving stories. First there is that of Propsero, the usurped Duke of Milan exiled to a deserted island and bent on regaining his position by using magic and cunning. Assisting him is Ariel, an impish spirit he saved who now owes him a year’s worth of debt. Then there’s the story of Prospero’s mightily pissed-off servant, Caliban, whose mother was the rightful ruler of the island before her death. When seeing an opportunity to dispose of his cruel master, Caliban eagerly enlists the help of a couple of drunkards who have been marooned on the island. Also stranded on the islands is the current Duke of Milan, the King, his court, and Prince Ferdinand, who quickly falls for Prospero’s daughter, Miranda. Of course adventure ensues for these lost travelers and for the audience who is treated to laughter, music, circus tricks, and superb acting under the stars. For the most part, Bear and Company play Shakespeare straight but this should not deter anyone from seeing The Tempest. The story is easy to follow thanks to some strong ensemble work and the entertaining physicality of the actors. Eleanor Crowder’s direction is superb: the show flows effortlessly, never lagging or being bogged down by prose. The second half is particularly fun to watch thanks to the antics of Stephano (Sarah Waisvisz) and Trinculo (Alexis Scott) as well as the over-the-top romantic overtures of Ferdinand (Isaac Giles) and Miranda (Hannah Ehman). Ehman is absolutely captivating, both as love-struck Miranda and as the elderly adviser Gonzalo. She brought vivacious energy and a sincere commitment to her characters that I found impressive and charming. Hers is a rising star definitely worth watching. Zoe Georgaras’ Ariel was also a favorite with her deft fire-weaving skills, exquisite movements, and playful nature. The acting in this production was underscored nicely by gorgeous music throughout: Doreen Taylor-Claxton’s voice was especially wonderful and I enjoyed the instrumental accompaniments. The one thing I’d have liked to see more of in this production is character development, particularly for Prospero. The emotional lives of the characters weren’t explored as fully as they could have been: the focus seemed to be on storytelling and amusement which Bear and Company delivered in spades. 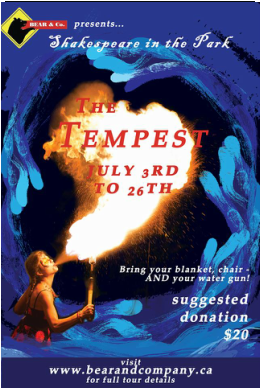 Overall, The Tempest makes for a great night out and is family-friendly fare perfect for a warm summer’s eve. There's nothing wrong with doing Shakespeare inside. Both of the Shakespeare shows I've done were performed inside, and I think they were pretty good — especially the second one. But there's just something about Shakespeare outside that just feels right somehow. And some plays especially — like The Tempest — are particularly well suited to it, even if there's something very fate-tempty about invoking storms when you're performing outside. Bear & Co.'s production, directed by Eleanor Crowder, was no exception. I caught their show last night in Hintonburg Park, which doesn't really offer any particularly distinct features, and whatever theatre ritual they did to keep the real storms away seems to have been effective, because the weather was perfect. I really enjoyed their use of music (directed by Rachel Eugster) — mainly a capella, with some interesting harmonies, and an occasional drum accompaniment. There a few moments when the timing was a bit less than perfect, when the singers were far apart and couldn't necessarily see each other well, and I question some of the blocking that put singers between the audience and other actors who were actually speaking lines, as it kind of obscured some of the dialogue. Mostly, though, it was good, and quite effective at setting suitable moods. The highlights for me were Zoe Georgaras as Ariel and Hannah Leigh Ehman as Miranda and Gonzalo. Georgaras (also known as fire dancer Zola Molotov) was everything your Shakespearean impish fairy should be: simultaneously cute and alluring, playful but a little dark, and able to scamper hither and thither without necessarily seeming to touch the ground. Throw in a little flaming poi, and I'm sold. Unfortunately for some of her fellow actors, she's so magnetic that it's sometimes hard not to look at her even when she's just hovering in the background, but some awesomeness just can't be contained. Ehman brought the right balance to her Miranda of naive innocence and the raging hormones of a teenager discovering... things. She took what is often a pretty nothing role, and really found a lot of humour in it, and was just generally really enjoyable to watch. Her Gonzalo was saddled with a beard second only to this one in its tragic awfulness, which I think was unnecessary. I understand the desire to make sure that the distinction between the 16-year-old girl and the old man, but I think it doesn't give enough credit to Ehman, whose distinct physicality, combined with the costume changes, would have been plenty to sell it. Seriously. The beard was terrible. Chris McLeod's Prospero fell a bit short for me. Prospero is the sort of role that needs to be played either with a big, booming authoritativeness or deliberately against that type. McLeod seemed to be aiming for the stentorian portrayal, but doesn't quite have the oomph to pull it off, so I would have liked to see him try something different. I'd also like to see him in a more comedic role sometime, because he has a certain warm quirkiness to him that, while it didn't quite work here, could be really good in another context. The somewhat unorthodox double casting of Ferdinand and Caliban was pulled off perhaps surprisingly well by Isaac Giles, and I really enjoyed that not only did this production embrace the bawdiness of Shakespeare, but that they gave most of it to the usually more straight-laced lovers. Alexis Scott and Sarah Waisvisz played Antonio and Sebastian, respectively, as well as the comedy duo of sorts (for which I always have a soft spot) of Trinculo and Stephano. They were fun to watch, and the ones who get to run around making asses of themselves are always the ones I'm most jealous of when I watch a play. And finally, Doreen Taylor-Claxton played a nice understated Alonzo, and is one of those delightful surprises who sounds like an alto when she speaks, and then BLAM busts out the soprano. Her goddess trio with Scott and Waisvisz was a lovely mid-show treat. The show runs on selected evenings in various parks until July 26, and is definitely worth seeking out. It's abridged (I assume), and runs about an hour and a half straight through, so although it seemed to be a bit long for some of the wee kidlets in the audience last night, it'll still get you home before the sun sets. Check out Bear & Co.'s website to find out when it'll be in a park near you. Eleanor has directed Shakespeare in Ottawa parks for the last 20 summers. A strolling player by nature, her exploration of Original Practices has included market places, deserts and all the pleasures of baking sun and total downpour. Recent projects include the o god series at Fringe, the SMILE series of songs and stories for seniors, and a solo tour of Shakespeare’s Will by Vern Thiessen. 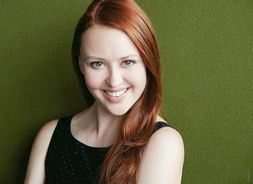 Look for her work on Sarah Waisvisz’s Monstrous next season. 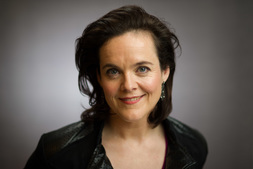 Rachel has served as music director for Bear & Co., Salamander Shakespeare Co., Gladstone Productions, and the GNAG Theatre Program, and as an interim conductor for Aiyue Choir Ottawa. 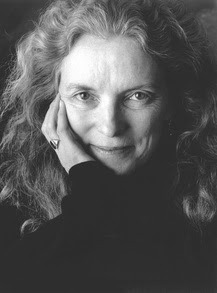 As an actor, she appeared most recently at the Gladstone as Amanda inThe Glass Menagerie, and as Alice in Age of Arousal. Rachel premiered her first original play, Whose Aemilia? at the Ottawa Fringe Festival in June. 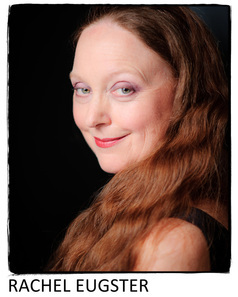 A lyric soprano with a Master of Music degree from the Peabody Conservatory, Rachel has appeared as a soloist with several local choirs and orchestras, and can be heard most often as a member of Dragon’s Tea Trio, with cellist Joan Harrison and guitarist Andrew Mah. Rachel is also the author of The Pocket Mommy (Random House), winner of a Great Book award from the Canadian Toy Testing Council. Doreen Taylor-Claxton is one of those fluid performers, working as a soloist, actor, chamber musician and music director, moving easily from one genre to the next. She has worked with Easy Street Productions; Up to Low (Poor Bridget), The Ottawa Stilt Union; Searching for Snails (Marvin the Flightless Bird), Odyssey Theatre; Arms and the Man (Catherine Petkoff), Deluxe Hot Sauce: SKIN (ensemble), NAC Pops Orchestra; Guys and Dolls (Agatha), The St. Lawrence Shakespeare Festival; A Grand Night for Singing (Lynn), Jesus my Boy (musician), The Taming of the Shrew (Widow), Measure for Measure (Francesca), Upper Canada Playhouse; Seaway Story (Sue), ThirdWall Theatre; Medea (Creon), Opera Lyra Ottawa Young Artists; Magic Flute (Pamina). She is a founding member of the theatre collective Deluxe Hot Sauce. Hailing from the bustling metropolis of Porcupine Ontario, Hannah first fell in love with theatre and music by participating in local community acting groups, piano lessons from her mother (thanks ma! ), vocal lessons and seven years touring on a competitive dance team. 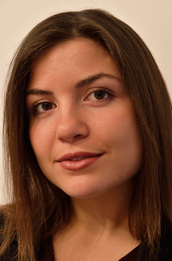 She made the trip to Toronto to peruse her love of theatre and performance, recently graduating from the joint Theatre and Drama Studies program between University of Toronto Mississauga and Sheridan College. Recent theatre credits include: Rusty in Footloose, Belle in Beauty and the Beast, Juliet in Capulets and Montagues, Mrs. Sapient in The Witlings and Rosemary Sydney in Picnic. She could not be more thrilled to be spending her summer outdoors making theatre with some talented folk, as Miranda & Gonzolo in The Tempest, her first production with Bear & Co.
Isaac Giles is entering his 4th year at the joint Theatre & Drama Studies program at U of T Mississauga and Sheridan College. Originally from the northwestern Ontario town of Sioux Lookout, he now calls Toronto home. 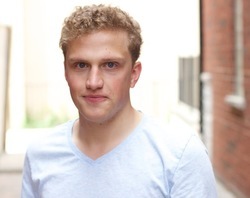 He is overjoyed to be spending the summer all through Ottawa’s parks in his first show with Bear & Co. His recent credits include Paris in Romeo and Juliet, Hector in Troilus and Cressida, Bisky in The Rover, Valentine in Arcadia, and Jesus in Jesus Christ Superstar. Isaac has also tried his hand at directing, co-directing The Tempest for the UTM Drama Club and Nathaniel Kinghan’s Chekov’s Clowns for UTM Fringe. 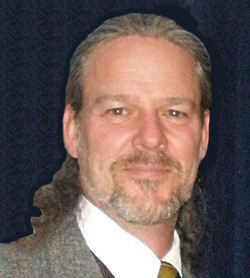 Chris McLeod was born in Smiths Falls and made his professional acting debut with Odyssey Theatre in 1988. He has an Honours in Theatre Directing from the University of Ottawa and a Master of Fine Arts in Theatre Directing from the University of British Columbia. He spent fourteen years as an actor and director with Salamander Theatre for Young Audiences where he was also Artistic Director. He was last seen on stage as De Guiche in ‘Plosive Productions’ Cyrano De Bergerac and most recently directed The Adventures of Red Rascalfor Rapscallion Productions at the 2015 Ottawa Fringe Festival. 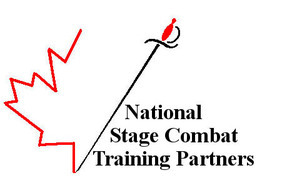 He is a founding partner of National Stage Combat Training Partners and he has a wife and two sons who are far too good to him. Alexis is thrilled to be back with Bear&Co. for her second Shakespeare in the Park! 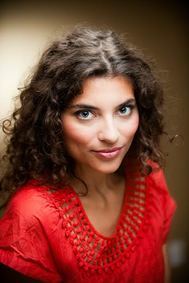 Alexis is a proud graduate of the Ottawa Theatre School and also studied acting at The University of Windsor. Alexis is the Artistic Producer of Vacant House Theatre who most recently wrapped up a sold out run of Frankie and Johnny in the Clair de Lune. Vacant House was also most recently seen filling the streets of Ottawa with theatre as part of The Magnetic North Theatre Festival. Favorite theatre credits include: Frankie in Frankie and Johnny in the Clair de Lune (Vacant House Theatre), The Reindeer in Narnia (9th Hour Theatre), The Anger in Ernestine in The Anger in Ernest and Ernestine (Vacant House Theatre), Adriana in The Comedy of Errors (Bear&Co. ), Jean Lobb in The Farm Show directed by Andy Massingham, Ada Lovelace in False Assumptions (Plosive Productions), Apollo in The Eumenides directed by Jodi Essery, and Suzy in Jelly Belly directed by Lib Spry. Next up, Alexis is traveling to London, England for a The International Meisner Intensive. What adventures await us! Sarah is delighted to muck around in the mud and play a swaggering scoundrel (or two) with this band of merry-makers—it is a nice change from writing and rehearsing her upcoming solo show Monstrous (stay tuned!). Recent performance credits include Bear & Co.’s The Glass Menagerie (Laura), 9th Hour’s My Name is Asher Lev (Rivkeh/Anna), and Zopyra Theatre’s Six: At Home (Little Swan). Recent playwriting credits include OCCUPY ME (Counterpoint Players) and ILoveOrangesAndHateThePort (New Theatre of Ottawa/2014 Extremely Short New Play Festival). *This is a Canadian Actors' Equity Association Production under the Artists' Collective Policy.